Regularly scheduled chiropractic care is an integral part of the chiropractic lifestyle – a way of life that focuses on preventing illness and disease, not just masking symptoms with drugs. When spinal bones (vertebrae) are misaligned, the result is a common condition called a vertebral subluxation. Left uncared for these areas of misalignment can spark a wide range of disorders, from carpal tunnel syndrome, to colic, back pain and migraine headaches and in the long run arthritis. You may already know that I use safe and gentle maneuvers called chiropractic adjustments to restore spinal alignment. But did you know that this all-natural alternative to drugs and surgery also helps prevent injury and disease? That’s because a healthy spine – where nerves are able to function without obstruction from misaligned vertebrae – is less susceptible to injury. Chiropractic is not a “cookie cutter” approach to health care. Each patient receives a specifically designed therapeutic protocol. Patients with identical symptoms and diagnosis may require very different care due to age, pre-existing health conditions and other factors such as how long they have had the problem. Generally speaking, the longer someone has a spinal problem, the longer it takes to correct it. By missing your appointment, you are, in essence, questioning the care plan your Chiropractor has outlined for you and prolonging your recovery. When healthcare is viewed as a partnership, it’s better for the patient and doctor alike. I like to encourage patients to an active role in their healthcare by asking questions and doing their “homework” when assigned: such as exercises, nutritional modifications and stress reduction techniques. I find that patients often skip these recommendations and if there healing seems to be taking longer than they like, they often ask “Is there anything else I can do?” My response is typically , “Yes, you can do your exercises everyday as prescribed and you can take your supplements and drink more water.” On the follow-up visit they then usually say something to me like, “Wow, those stretches/exercises really help!” They do, but only when you do them. I don’t assign exercises because it’s fun for me to go through them with my patients. I assign them because they really help! Chiropractic care is cumulative. At each appointment, we make progress that builds on that obtained during the previous visit. Missing appointments breaks this continuum of care and can result in missing out on chiropractic’s full therapeutic benefits. Retraining your spinal joints and ligaments needs consistency, just like getting in shape with exercise requires committed consistency. Hey, this is the case with everything from learning to play the piano, learning a new language, playing a new sport or trying to build muscle in the gym. Repetition is required to train your body and brain to respond appropriately…it’s not the same as aligning a car. One study indicates that chiropractic adjustments boost polymorphonuclear neutrophils (PMN) and monocytes – white blood cells associated with a healthy immune system. (J Manipulative Physiol Ther 1991;7:399-408. Chiropractic care may also help lower blood pressure by promoting stress reduction. Other studies link chiropractic care with a reduced risk of developing chronic pain. Parkinson’s disease, infantile colic, ear infections, multiple sclerosis, and fibromyalgia. In addition to keeping the spine in optimal condition, regular chiropractic care helps patients learn to manage stress and minimize its impact on the body. Stress causes muscles to tense, speaking – or worsening – vertebral subluxation. Anticipatory fear and anxiety – both about procedures and bad news – often prevent patients from keeping appointments, according to research from the University Of Nebraska Medical Center (Ann Fam Med 2004; 2:541-5). Doctors of chiropractic ease fears by carefully and thoroughly explaining all procedures. This not only has a positive effect on appointment-keeping behavior, but also promotes healing. A recent study shows that 160 rodeo riders, fearless by nature (or default! ), healed faster after a whiplash-inducing accident than did 140 similarly injured spectators. “What we found is that rodeo athletes recover faster and miss less work,” says study author Dr. Robert Ferrari. 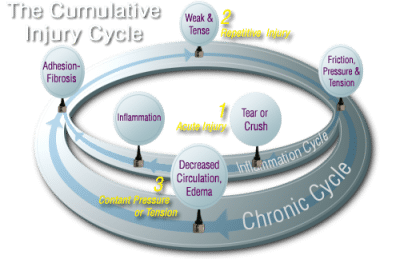 “It may be that athletes are physically more fit….. or it may be that athletes have a different attitude toward injury and they think the best way to deal with it is to keep going.” (J Rheumatol 2006; 33:975-7). This study indicates that the less anxiety about chiropractic care the more likely to recover faster. Keeping an appointment helps dispel anxiety, squash fear and hasten healing. On a personal note, I have seem super shy kids come out of their shells after undergoing chiropractic care in my office. I have seen men and women become more confident in themselves. Is it because stress is reduced by the adjustment? Is it because once the subluxations are removed their nervous system has less tension? Is it because the pain was holding them back? Is it because their posture is improved and they can stand taller? Perhaps it’s all of the above. 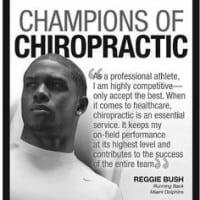 Chiropractic boosts athletic performance by strengthening the body’s entire musculoskeletal system. One analysis involving the U.S. National Football League (NFL) found that “a substantial majority of NFL trainers have developed cooperative relationships with chiropractors, with 77% having referred a player to a chiropractor. Today, just about every NFL team has a chiropractor officially on staff. Additionally over the years Chiropractors have become indispensable to the US Olympic teams and are recruited to treat Olympians in the pre-Olympic training camps and at the Olympic Villages. Mapping of brain activity before and after chiropractic adjustments of the cervical spine revels that chiropractic care stimulates cognitive function. Cervical manipulations also enhances response mechanisms in the brain, according to researchers in New Zealand who conducted a study involving 30 volunteers: all with evidence of cervical spinal joint dysfunction. Instead of cortical mapping, the researchers used reaction time to various stimulation as a gauge. “Multiple sites of cervical spinal joint dysfunction were related to impaired cortical processing, “noted the researchers. This was demonstrated by “significantly less accurate response selection and a trend toward more variable performance of an anticipated response.” (J Manipulative Physiol Ther 2005; 28:502-7)After chiropractic adjustment, the volunteers demonstrated improved cortical processing and response selection. Regular chiropractic care may boost performance by warding off work-related injuries, including carpal tunnel syndrome and low-back pain. Unremitting LBP can lead to work absence and higher medical costs: the focus of a study published earlier this year. Chiropractic care effectively restores proper spinal alignment and reduces low-back pain. Missing appointments however, may foster a “one step forward, two steps back,” scenario. When you skip your appointment without alerting us in advance, it’s disrespectful to everyone. Particularly because another patient may have to suffer an extra day because we were originally booked up. I only see one patient at a time currently. So, when you cancel your appointment last, I’m left with nothing to do during the duration of your scheduled treatment time…it’s time wasted. We certainly understand that emergencies arise, and advance notice is not always possible. But, more times than not, it really is. Knowing about a cancellation in advance gives our office the opportunity to reassign and reschedule your appointment to someone who really needs it. If you have any questions regarding our scheduling policy, please ask someone at the front desk. I look forward to seeing you at your next appointment! Don’t forget to do your exercises! ⟵Do You Have “Ticks & Fleas”?